We place high demands on the quality of our production processes and comply with recognised standards for the manufacture of feedingstuffs. 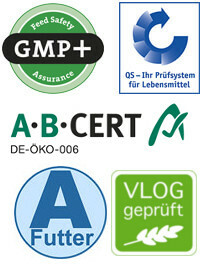 The certification in accordance with GMP+, the delivery authorisation for QA companies, the compliance certificates for A-Futter, GM-free production and for feedstuffs, which can also be used in organic farming, in addition to an integrated HACCP system vouch for the quality philosophy of the company in an impressive manner. As a registered and officially approved compound feed manufacturer for feed supplements and additive mixtures, Ligrana GmbH completely fulfils the requirements of the Feed Hygiene Regulation according to EC 183/2005. Furthermore, the certification according to DIN EN ISO 50001:2011-12 confirms the Energy Management System used and the responsibility for sustainable production with careful handling of the resources that is associated with it. In order to guarantee maximum safety for transport, the environment and product use, the product and safety data sheets are continuously monitored and updated.